Ileni is now a prisoner to the Empire, the very thing she despises. She is a weapon, but not an assassin. At the Empire's Academy, she learns how to use combat magic, with lodestones to help her. Ileni hates it - her people are all about healing and peace, not war and slaughter. But Ileni has a goal, and she must see to it that she finds the truth. But she will have to choose a side, and that could mean betraying the assassins, or losing her life. I liked Ileni a lot in Death Sworn, and I like her still. She is a strong and hardened, tough as nails, yet gentle and calm. She has a lot of poise for someone who risking everything by sneaking around behind the Empire's back. Ileni loses her way, but she tries her best to stay true to herself and her people. I definitely could put myself in her shoes and could see myself making the same difficult, heartbreaking decisions that she had to make. This book introduced a slew of new characters. Cyn, a cruel and vicious pupil of the Academy, with her own magic (like Ileni used to be). Lis, her twin, with no magic of her own, a shell of her sister. Evin, the powerful nephew of the scary head of the Academy. And a familiar face... Arxis, an assassin. Except that no one at the Academy knows who Arxis really is. I really like all of the new characters, even if I hated some of them. They are so well characterized and constructed and have distinct personalities. I especially liked Evin - he is so easygoing and friendly, but really, he is the most powerful of all of them, and could kill them all with the amount of power in his pinky finger. He's a real sweetheart. I think I liked the story of this book, but I don't think it was enough for me, in terms of a conclusion novel. Like, if this were a sequel novel, and there were more books in the series, I would like this one more. But if you put things into perspective (knowing that this book is the last book, of the duology), then, well, I'm not satisfied. Read on. I definitely needed more from the story. Ileni is stuck in the Empire's Academy. That's kind of the state of affairs throughout the entire book. I couldn't really grasp what Ileni's end goal was. I didn't understand why she was there, what she was trying to accomplish, how she was going about accomplishing it. This book probably could have been cut in half, because not that much happened, and what happened was important, but didn't really do much for the overall plot of the series. The first book definitely had more action in it, despite everything happening in the cave. This book read quickly, the events went by pretty quickly, but it didn't feel like much was happening. Ileni is avoiding Karyn (the head of the Academy), Ileni is contemplating whether or not to contact Sorin, Ileni is struggling to use the magic. A lot of internal battling, but not a lot of external ones (in my opinion). Or maybe I just wanted more. Sorin is basically NOT in this book. We get his third person perspective in like, two chapters (the whole book is in third person, but limited to Ileni, except for those few instances where the author showed Sorin's perspective). I was disappointed, because I really, really liked Sorin in Death Sworn. And I'm not necessarily talking about as a love interest - he's an interesting character. So... the romance. I'm not really happy with the romance. It's really not in this book at all. It doesn't progress forward... if anything, we go backwards. Think about it - Sorin and Ileni aren't really interacting in this book. I don't want to spoil things, but them not together affects their relationship, sort of. I'm not saying the romance is BAD, or badly constructed... but I wanted more, for sure. That was a complaint I had in Death Sworn - that I wanted more romance. I wanted more in this book as well, and didn't get more. The ending needed to be more solid, in terms of the romance. Ugh! It's so hard to explain, but I didn't hate the romance. I just didn't like it either. It bothered me, but not enough to rage. I could see why the author took the direction she did, but still... hmph. If you read Death Sworn, definitely give this novel a shot. It's worth the read, especially since this series is only a duology. However, don't do what I did. Don't go in with super high expectations. Don't be *too* excited, basically. Then you won't be super disappointed. 3 stars. I liked it, but I wanted more. I definitely think there is room for another book, if the author chose to write another and/or got a contract for a third. There are plenty of loose ends (in all aspects of the story) that could be tied together! Oh that's awesome! And I think you need to read the enter book to understand the romance, but I agree, that was one disappointing aspect. I'm sorry you won't enjoy it! But happy reading, Carina. And thank you! Thank you for your very honest review as always, Alyssa! I'm not sure if I'm gonna read this duology after all, I know you really liked book one, but a conclusion novel that leaves you a bit meh? Not something to look forward to! Right?! Waahh :/ I kind of hope there will be another book, but I know the author only planned for a duology. Ugh! So frustrating! So disappointing! I mean, it was an okay book, but not a strong enough conclusion novel. Agghh. Sadness indeed! I know what you mean. 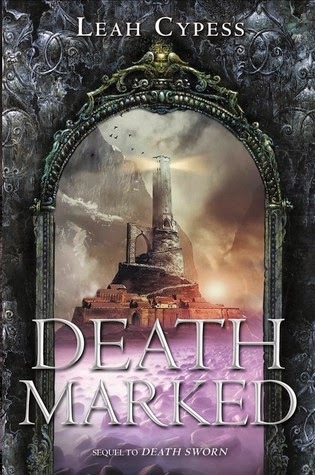 Death Marked is okay, but I liked Death Sworn better. I think it struck a better balance between Ileni's internal conflict and a larger (more action-y) plot arc to carry her along so she couldn't whine and stagnate for long. Glad I wasn't alone! Death Sworn was soooo good - I think I expected too much of Death Marked. Or maybe it just wasn't enough in general.